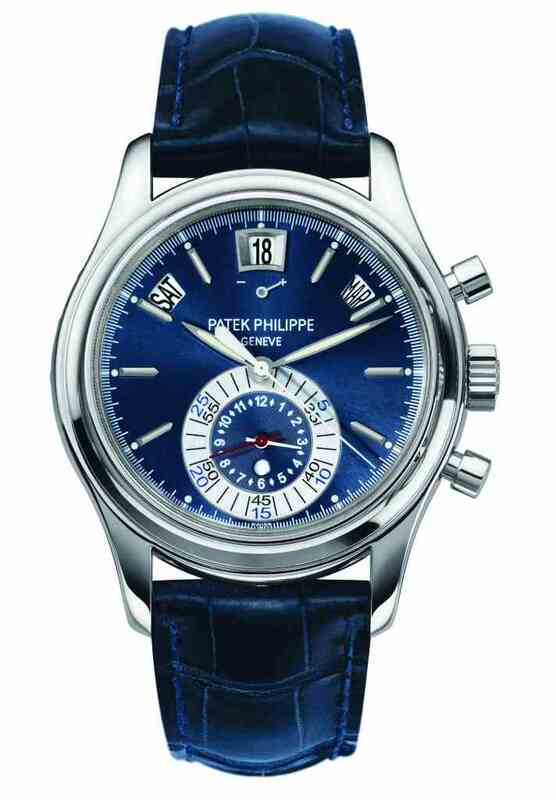 Launched in 2006, the Patek Philippe Ref. 5960P Annual Calendar chronograph was endowed with the first regularly produced chronograph movement developed from the bottom up by Patek Philippe and crafted entirely in-house from the movement blank to the finished caliber. It is a very modern self-winding movement with a nearly wear-free vertical clutch. A genuine manufacture chronograph movement combined with Patek Philippe’s legendary Annual Calendar was exactly what the market had been waiting for. As a matter of fact, the Annual Calendar chronograph instantly became one of the manufacture’s most sought-after models. The 2006 debut platinum model with the charcoal gray dial received a sibling in 2009: a rose gold version with a dark silvery gray dial. 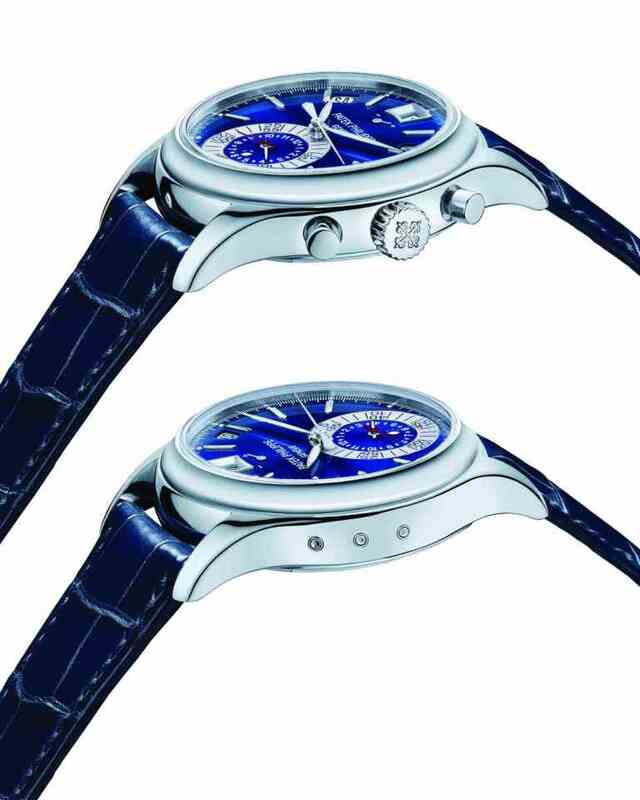 And now, the collection is being expanded by a second platinum model with a matt blue sunburst dial. The Ref. 5960P unites a mechanical flyback chronograph and an Annual Calendar, two of the most popular complications in timekeeping. The calendar mechanism is based on a patent granted to Patek Philippe in 1996 for the Annual Calendar – it relies on wheels and pinions rather than the more common levers to control the calendar displays. The underlying idea is that rotary motions are more straightforward and easier to control than the reciprocating movements of levers. In actual fact, Patek Philippe’s annual calendar mechanisms have a proven 15-year track record for above average functionality and reliability. The manufacture’s patented Annual Calendar is a full calendar that automatically distinguishes months with 30 and 31 days and, if kept running, only needs to be manually corrected once a year on the first day of March. It shows the day of the week, the date, and the month, and it has an am/pm indicator. The chronograph module of the new Ref. 5960P is just as modern. It relies on the traditional columnwheel construction for controlling the start, stop, and reset commands, but instead of a lever for a horizontal wheel clutch, it actuates the clamp of a vertical disk clutch. This solution is extremely dependable and eliminates the risk of hand bounce in either direction when the chronograph is switched on, because no wheels are abruptly engaged. Since the disk clutch is virtually wear-free, the chronograph hand can be used as a running seconds hand without hesitation. This mode of operation has no negative effect on the rate accuracy of the movement. This is why the Ref. 5960P, contrary to most chronographs, has no seconds subdial. Like the first 2006 model, the new Ref. 5960P has a round case in 950 platinum with an anti-reflection coated sapphire-crystal glass and a sapphire-crystal display back. The round chronograph pushers and the large easy-grip crown are located on the right-hand side of the case. The push pieces for adjusting the calendar indicators are on the opposite side. With a case diameter of 40.5 millimeters, the Ref. 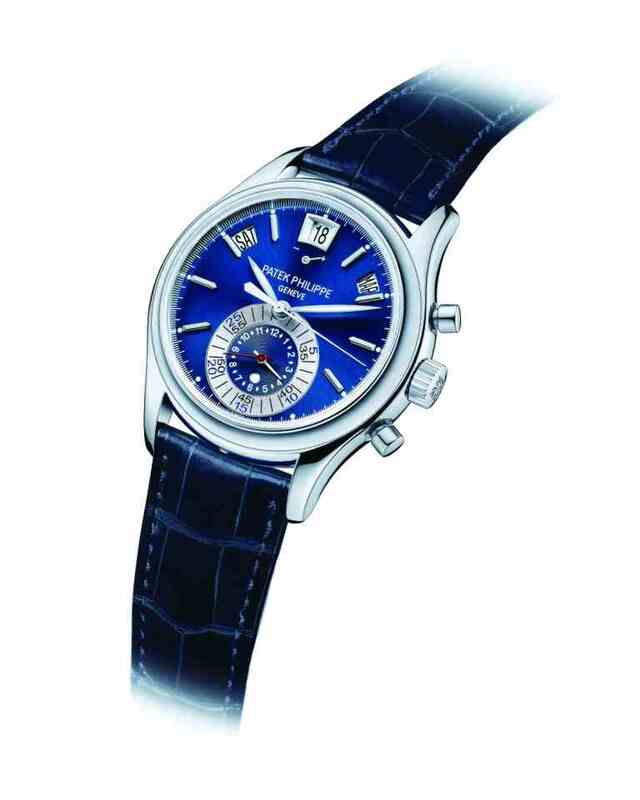 5960 ranks among Patek Philippe’s larger timepieces. Its stately visual presence is amplified by the tangible weight of the platinum case. These decidedly masculine attributes underscore the technical appeal of the chronograph. The watch is worn on a blue, large-scaled alligator strap with a platinum fold-over clasp. The matt blue sunburst dial with the two-tone monocounter in blue and silver is totally new. Blue harmonizes with the cool gloss of platinum and creates a new timepiece personality with emphasis on fast and convenient readability of all indications. Unlike most other chronographs, the Ref. 5960P does hot have three subsidiary dials for the running seconds as well as the minute and hour counters. Instead, it features the combined minute and hour counter on a subdial that largely occupies the bottom half of the watch face. On three concentric scales, it indicates the minutes and hours totalized by the chronograph. The two outer scales are assigned to the longer red hand that shows elapsed minutes from 0 to 30 (blue numerals) and from 30 to 60 (black numerals). The shorter white hand indicates recorded event times of up to twelve hours on the innermost scale. The day/night indicator in the small round aperture progressively changes from white (day) to dark blue (night). This function is particularly useful when the watch has stopped, making it necessary to distinguish between morning and afternoon hours when setting the time and the calendar indications. The upper half of the dial is dominated by the Annual Calendar, which indicates the day of the week, the date, and the month in three apertures arranged along an arc between 10 and 2 o’clock. The size of the date at 12 o’clock is particularly remarkable. With its polished white gold frame, the date aperture forms a visual equilibrium with the prominent monocounter in the bottom half of the dial. The small hand of the power-reserve indicator beneath the date aperture moves from plus to minus as it shows the state of wind of the mainspring. Eight slender applied hour markers in white gold, eleven luminescent dots, and the crisp transferprinted scale produce the clarity needed for instant legibility of the dial. The tips of the leaf-shaped hour and minute hands extend nearly all the way to the hour and minute markers, and the end of the chronograph hand skims the fractionally graduated seconds scale.